The University of Maine at Presque Isle’s very own, and first-ever student Distinguished Lecturer, Ghazaleh “Oz” Sailors will serve as the next speaker in the 2014-2015 Distinguished Lecturer Series on Tuesday, Nov. 18, at 7 p.m., in the Campus Center. Sailors will deliver her talk, Breaking Barriers and Chasing Dreams. Her talk is free and the public is encouraged to attend this special event. A senior at UMPI majoring in Physical Education, Sailors is the only woman playing NCAA Baseball this year. She has also achieved the important milestones of serving as the first female pitcher in the history of UMPI’s baseball program and serving as the team’s first female co-captain. Sailors began playing baseball at an astonishingly young age: only two years old, because her older brother’s tee-ball team needed one more member. Sailors has overcome many challenging obstacles throughout her athletic career; she’s often been told that baseball is a male-oriented sport and she has dealt with people’s prejudice and sexism, as well as harassment, which resulted in her changing high schools. That didn’t stop her, however, from making high school baseball history when she and another girl, Marti Sementelli, became the first female starting pitchers to face off against each other in a varsity game. 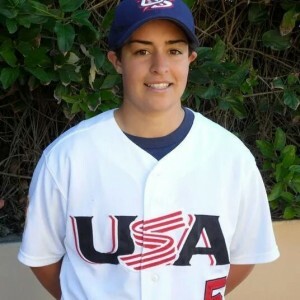 Sailors also has represented her country by pitching and playing for the U.S. Baseball Team in Venezuela in 2010. She played in the Women’s World Cup of Baseball in Venezuela for Team USA, which won a bronze medal during the event. Sailors spent two summers playing men’s summer collegiate baseball in Western Canada. She’s played in Fairbanks, Alaska, in the “Midnight Sun Game.” Sailors was also the first female to play baseball in the National Baseball Congress World Cup Series in Wichita, Kansas. Sailors has played competitive baseball in a total of 27 different states. Following her dream of playing college baseball, Sailors turned down an NCAA Division I softball scholarship and instead enrolled at UMPI in 2011. Sailors since has played three sports for UMPI: nordic skiing, cross-country running, and baseball. In 2012, Sailors received UMPI’s Baseball “Rookie of the Year” Award. During last season, she held the team’s only NCAA win against Valley Forge Christian College in Pennsylvania. During Sailors’ college baseball career, she’s achieved two impressive accomplishments: on April 30, 2013, she pitched a scoreless 8th inning at UMPI, and was thought to be the first woman to do this against a Division I team. Then, several days later on May 5, Sailors served as the starting pitcher, and, in 5 innings, only allowed 6 hits and 1 run. This marked the first time a woman had been credited with a baseball win in the United States Collegiate Athletic Association (USCAA). The University’s Distinguished Lecture Series was established in 1999. Each year, the UDLS Committee sponsors four to six speakers who come from Maine and beyond, representing a range of disciplines and viewpoints. While the emphasis tends to be on featuring visiting academics, it is not exclusively so. The speakers typically spend two days at the University meeting with classes and presenting a community lecture. This is the first year that the University has invited students to participate in the series as Distinguished Student Lecturers. All are invited to attend Sailors’ distinguished lecture. For more information about this event, contact the University’s Community and Media Relations Office at 207-768-9452.